Historical perspective – Northern Rivers Wildlife Carers Inc.
At least some things have improved for Flying-foxes in the twenty-four years since I started caring for them. My first rescue was a baby I found alone on electric wires on our property and rescued by climbing a tall teak tree with our pool pole and scoop in hand. 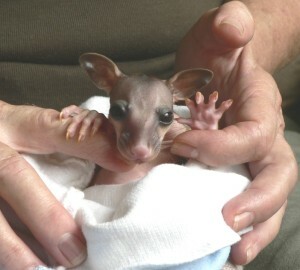 We rang the National Parks and Wildlife Service (NPWS) and asked where to get information on how to care for him. They were very pleased to tell me of a vet in Bangalow who had just returned from doing a course on native wildlife rehabilitation. Imagine how shattered I felt when I asked him for information and he replied: “A baby Flying-fox! Why would you bother!” That would never happen now. 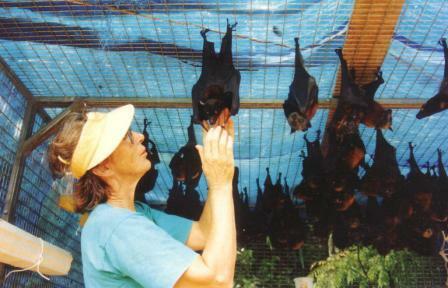 The Kuringai bat colony group gave us all of the information we needed and Helen George was our teacher. We had two phone calls a day to her in Sydney in the first month. She was a great mentor. It was fun for the first year with one baby, and even more fun the next year with “Basil” and “Manuel”. Then we told NPWS that we knew how to do the raising of baby flying-foxes. The following year we had six babies. A notice on the Lismore library board brought us our dear friends Roz and Bruce, who are still caring after all these years, along with several others. We had weekly weigh-ins on our veranda with afternoon tea. Next year I had twelve babies to look after and I had permission from the Lismore Car Boot Market organisers to stand at the entrance and let our three most gentle and appealing babies charm the general public. I signed up two or three new carers each weekend. These were the good old days before Lyssavirus appeared in 1996, and people with “animal-mad” kids could help the babies with their early morning “sun kicks” – albeit with supervision. We loved to get the babies on racks for display where the general public could see them and be enchanted. This really turned around a lot of very anti-Flying-fox attitudes – especially with old “bushies” and farmers. One year we had three in vets’ waiting rooms, five in a neat little group led by Roz at a local high school (where she taught) in a library side room and two in the school in shared rooms. The mind boggles now! When NPWS said they needed to make all of the individual carers into a licensed organisation the bat group was by far the biggest with 25 active carers. I was thrilled as we were in need of funds, insurance and a wider group of dedicated rescuers, and my husband and I were run off our feet. This was the formation of the Northern Rivers Wildlife Carers in 1992.